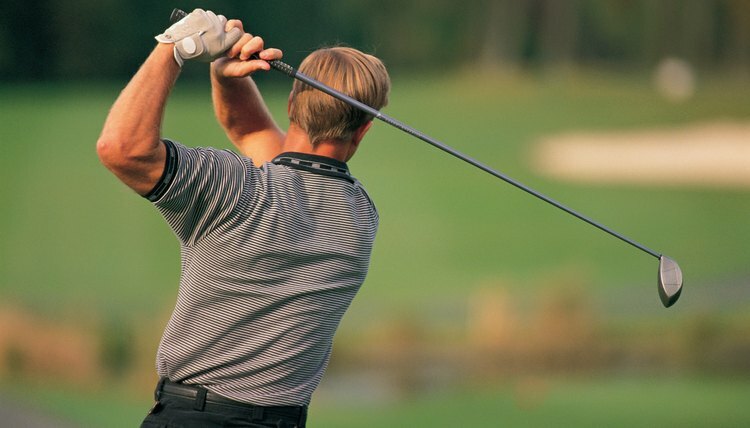 Choose a stiffer shaft if you swing harder. Golf club shafts come in five flexes and both graphite and steel shafts use the same system for determining flex. Because golf shafts bend during a swing based on how fast your club speed is, the faster your swing, the stiffer the flex you need. Since you need to make sure the club face is square with the ball at impact, finding the right flex is critical to consistently hitting the ball well. Regular and firm flexes -- also known as stiff flexes -- are the most popular among men. More commonly known as the stiff shaft (S), this flex is favored by golfers who have a fairly fast swing and drive the ball 250 yards on a consistent basis. Golfers who play a firm or stiff shaft have club speeds between 90-105 mph. A regular (R) shaft is favored by golfers who have a medium-fast swing and drive the ball between 225-250 on a regular basis. Golfers who play regular shafts have club speeds between 80-95 mph. Golf club shafts come in three other flexes: extra stiff (X), senior (A) and ladies (L). The extra stiff shaft is used only by players who consistently drive the ball 300 yards or farther. The senior shaft is a little softer than a regular flex, and male golfers switch to this shaft as they age. Golfers who hit the ball between 200-225 off the tee should choose a senior shaft. The ladies shaft is for golfers who drive 200 yards or less. When selecting golf club shafts, it is better to buy a softer flex than a stiffer one. Flex is related to ball trajectory, so if you choose a shaft that is too soft, you might have trouble getting air under the ball. If you slice, a softer shaft may help. If you hook, a stiffer shaft may help.